Do you feel frustrated when you listen to native speakers, as if we use English in a completely different way than what you learned in your English class? Is there something missing in the flow of your communication, like a block in your mind that prevents you from feeling natural when you speak English? What are you going to get when you go to the store tonight with the wife and kids? 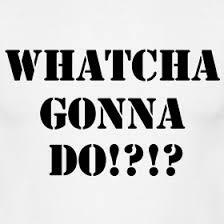 Wha-da-ya gonna get when ya go-da-the store-danight wi-the wife ‘n kids? We will explore this topic more in future texts, but if you’re an official member of the RLE Community, we teach this in the Real Life English Mini Course, FREE to Newsletter Subscribers. This definition probably sounds complicated, but now we’ll present a comparison of two sentences: one with discourse markers (Example A) and the other, which is the nearly the same sentence, without them (Example B). Listen and see how they each flow and try to feel the difference in meaning. The difference is subtle, but it is significant. This video is the perfect model for the music behind the words. Even as a native English speaker, if I don’t pay attention, it seems like they are speaking in English. The only problem is that the words aren’t real. PRACTICE: Play the video again and see if you can hum along or make your own jibberish (nonsensical speech without real words). As Paddy Kennedy says in the video, “you want to train the organs of articulation: the tongue, the cheeks, the lips, the whole mouth- and exaggerate.” We recommend tongue twisters, music, and imitating natural native speaking. Record yourself speak. 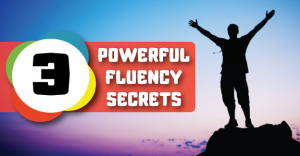 So now that you’ve learned about the 3 Most Powerful Fluency Secrets They Don’t Teach in School, which include Sound Morphing, Discourse Markers, and Rhythm and Flow, what can you do to integrate these into your learning process? How can you make your learning fun, effective, and permanent? Unfortunately there aren’t a lot of good resources on these topics, but if you open your ears and become an active learner, use authentic experiences from your life to learn, and especially pay attention to how the language is actually used by native speakers, you will start learning naturally. If you want to make the most of what we have to offer, join our online Facebook community, listen to our weekly RealLife Radio audio podcast, but more importantly, sign up to our mailing list where you will get all the newest information of what’s going on at Real life English. We invite you to sign up and take advantage! Take care. Dude, this is great! This kind of stuff blows my students’ minds when I teach it to them. They really have never learned these dynamic aspects of the language, but they are KEY to understanding real life English. thanx a million about that effort. This guy has nailed some truths. This is an awesome work, man. I have a lot of info to learn here. I gotta read it a lot of times now. Many thanks. Justin, what a great collection of tips and videos to improve English fluency! This is my favorite article by RLE so far along with “How Learning English Can Make You a World Citizen”. I’ve forwarded the link to this webpage to several Brazilian friends who can read, listen, and write fluently in English, but aren’t easily understood when speaking to a native English speaker or a non-Brazilian foreigner. These friends have yet to master the art of imitating the phonetics and musicality of the English language. Although they use contractions, they cannot effectively apply sound morphing and connected speech when speaking. I think this article and videos have the power to take my friends’ English speaking skills to the next level! Thank you for taking the time to compile this information in such clarity and detail. Cheers to RLE! Justin, what a great collection of tips and videos to improve English fluency! This is my favorite article by RLE so far along with "How Learning English Can Make You a World Citizen". I've forwarded the link to this webpage to several Brazilian friends who can read, listen, and write fluently in English, but aren't easily understood when speaking to a native English speaker or a non-Brazilian foreigner. These friends have yet to master the art of imitating the phonetics and musicality of the English language. Although they use contractions, they cannot effectively apply sound morphing and connected speech when speaking. I think this article and videos have the power to take my friends' English speaking skills to the next level! Thank you for taking the time to compile this information in such clarity and detail. Cheers to RLE! Great article! Very useful. I still have some trouble understanding native speakers. There are some “sound morphing” examples here that I didnt know yet. Thanks guys for the great work! PS: The link for the fake english song is broken. Thanks for sharing and for lighting up the spark over and over to continue learning and teaching. Reading, learning and teaching with these tools really makes me remember why I love my job. Your passion is contagious. God bless! Greetings from Mexico. Hey Yezmin, I really appreciate your nice message. I’m glad our resources are helpful for you! Thanks for commenting and have a nice day! This stuff is great! And it is so true!!! Love this website, I feel much more confident when I read those things. You guys really help us to be better teachers and I am very thankful for that. Great to know it and thank you a lot. anyway, could you give me more example about English fluency bits or discourse markers? Thanks for reading and sharing your thoughts Adam! Here’s an article that goes deeper into the pronunciation side of this — https://reallifeglobal.com/pronunciation-fluency/ and here’s a course we have that can give you a lot more direct real life experience with this stuff — http://fluentwithfriends.com/ Let me know if you have any questions! wonderful tips about becoming fluent English speakers!!! Thanks!! Thanks so much Graciela! Much appreciated!